There's a reason My Fair Lady is one of the most beloved musicals of all time. 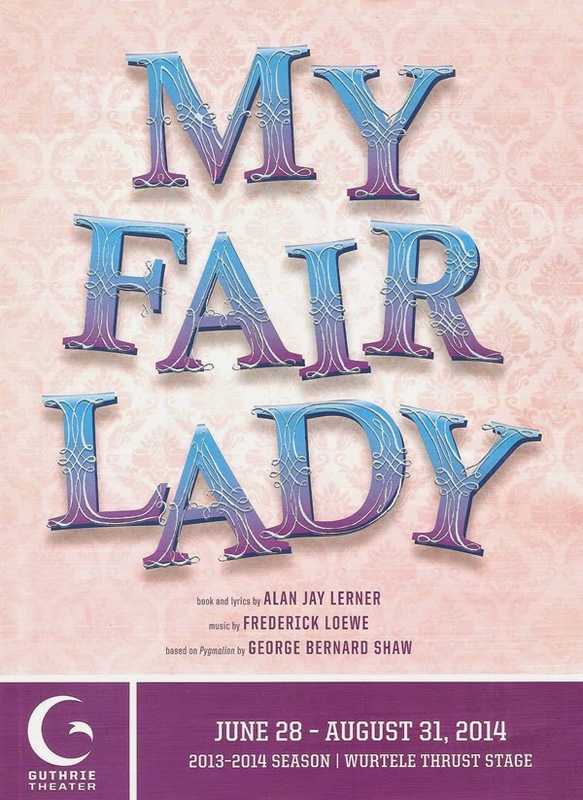 Not only does it feature a bunch of wonderful songs by Lerner and Loewe that have become classics (including "Wouldn't it be Loverly," "Get Me to the Church on Time," and "I Could've Danced All Night"), but it's based on the George Bernard Shaw play Pygmalion that deals with issues of class, gender, societal expectations, and the intersection of wealth and power. It's a musical that has style and substance. The Guthrie's gorgeous new production does well by this classic. The show is perfectly cast, the familiar music sounds great, the choreography is fantastic, and the sets and costumes are luscious. This hugely entertaining show is definitely a must-see summer blockbuster musical. I'm not sure the obligatory plot summary is necessary here; even if you think you aren't familiar with the story, you probably know it. It's been retold many times, from the original Shaw play (which was in turn based on a Greek myth) to the Julia Roberts movie Pretty Woman. A gentleman takes a lower class woman and transforms her into a "lady." In this case, the gentleman is Professor Henry Higgins, who studies phonetics and is intrigued by flower girl Eliza's poor accent, and makes a bet with his colleague Colonel Pickering that he can transform her into a lady in six months time. Eliza does indeed learn to be a "lady," but retains her spirit and even teaches 'Enry 'Iggins a bit about being a human being in the process. Most of the lead roles are played by non-local actors from around the country and the world, and even though I'm biased towards our wonderful local community of theater artists, they're all fabulous. Helen Anker, from England, is so charming and spirited as Eliza, and believable in the transformation from Cockney flower girl to sophisticated lady. Jeff McCarthy is the perfect Henry Higgins - even though he's thoughtless, selfish, prideful, and kind of a jerk, there's something so appealing and charming about him that you love him even as he annoys you with the stupid things he says. I just wish that this was more of a singing role, because unlike the original Higgins, it sounds like this guy can really sing. Rounding out the trio is Aussie Tony Sheldon as a delightfully amusing Pickering. And of course, we can't forget about Eliza's pop, a charming rogue as played by Donald Corren. The large ensemble is full of too many familiar faces to mention, all of whom are great fun to watch. And they create some full and gorgeous harmonies (e.g., the "Loverly Quartet") under Andrew Cooke's musical direction, accompanied by his six-piece just barely off-stage band. Featured roles played by some of our local favorites include Robert O. Berdahl as the hair-flipping Hungarian, Angela Timberman (who can still crack me up with a single look) as Higgins' loyal yet exasperated housekeeper, and Melissa Hart as Higgins' mother, the only one who truly has his number. And then there's Tyler Michaels. His rendition of on "On the Street Where You Live" is a definite highlight of the show; I wanted to reach for the remote and rewind so I could watch it again! (Luckily he comes back for a brief reprise in the second act.) Not only does Tyler have a great voice, but he brings a unique physicality to every role he plays, including this one. Freddy has an awkward grace, he's a bit of a clutz around Eliza, but the love he feels for her flows out of every pore. I've never seen this song performed so comically and physically before - leaping across the stage, standing on top of props, dancing with bicycles and flowers and whomever wanders into the scene. It's truly joyous. Joe Chvala's flying foot choreography, well performed by the ensemble, shines in the elaborate and busy group numbers. He incorporates percussive slapping and clapping, as well as the use of props from brooms to parasols. The prim and proper ladies and gentleman at the races create some beautiful images as they move delicately and gracefully across the stage. In contrast, the entire street comes boisterously alive in the audience's favorite scene (judging by the applause that continued for several minutes), "Get Me to the Church on Time." Fabio Tobloni's costumes are gorgeous as expected (the extravagant hats! the spats! 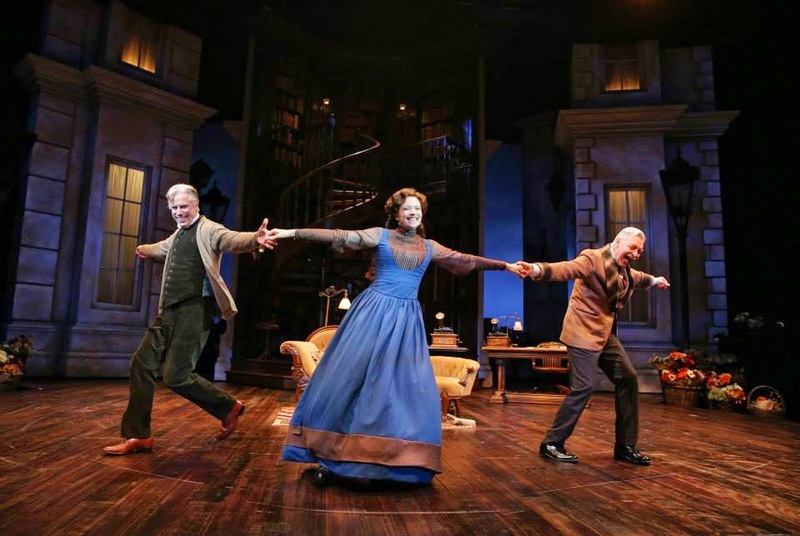 ), and the set by Walt Spangler is truly impressive, with three massive moving pieces that turn to reveal different facades, including Higgins' two-story library with spiral staircase. All of these pieces come together beautifully under Joe Dowling's direction to create a feast for the eyes and ears. My Fair Lady continues through the end of August. It's sure to be a big hit, and deservedly so. The show is so full of life and energy and dance and music, it's almost impossible to take it all in in one sitting. Lucky for me I get to see it again with my season ticket, so I'll have a chance to relive the many wonderful moments. Those hats were such a treat to make! Fabio is an incredible designer to work with. I'm thrilled you enjoyed the show! Hi Samantha, thanks for the note. Do you work in the costume shop at the Guthrie? What a fun job that must be! I don't know how those women could walk around with those huge hats on their heads, they're fantastic! !